31.12.2009 : Here’s our last “ANS / Pharmacy Cigar Smoke in 2009” – See you in 2010 !! Liebe Freunde,ich wünsche euch und euren Familien ein Frohes Fest sowie Glück und Gesundheit für das Neue Jahr. Dear Friends,wishing you and your families a merry Christmas and a happy and healthy new Year. 19.12.2009 : Coming close to year’s end, here’s a “Happy End for Mr Punch” – a privately commissioned humidor manufactured by Jose Ernesto Aguilera Reina – a Cuban artist, famous for his humidor works of art which have been auctioned at many Festival Gala dinners. Gracias a Ernesto y a Toni “Puro Cubano” !! Happy New Year, Mr Punch !! 15.12.2009 : Here’s a short report on the last trip “Winter Sun in Spain”. 13.12.2009 : Inge and I just returned home from Spain in time to celebrate our 25-th anniversary. 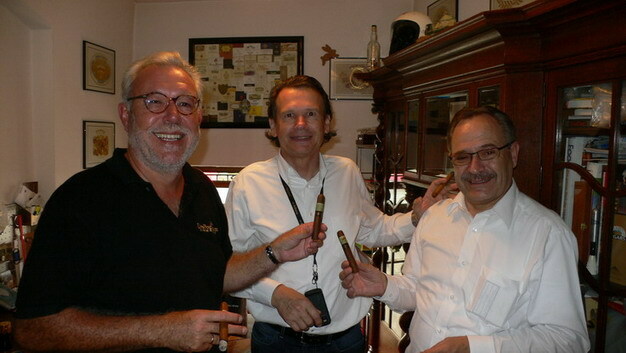 we had a very precious 24 hrs with Mr Urs Portmann and some very good friends enjoying fine cigars and true generous hospitality at Portmann Cigars in Kreuzlingen – Danke lieber Urs, Marlene, Marc, Portmann Team, Hans and all friends !! 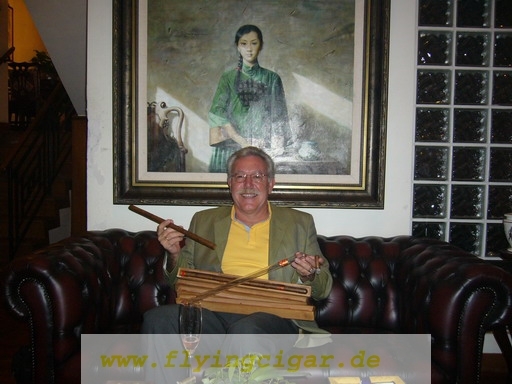 30.11.2009 : A perfect weekend at Portmann Cigars in Kreuzllingen/Switzerland, the report is coming up, but first a picture gallery of “Strictly Juan Lopez Nr 2 – By Portmann Cigars” / Enjoy ! 25.11.2009 : A well spent evening in the office with Andreas produced this “Joint tasting-review of the Punch Platino ER India” yesterday- A very tasty lady wrapped in a silver sari ………. Ein paar gut ausgefüllte Stunden mit Andreas im Büro gestern Abend haben dieses Tasting hervorgebracht. 22.11.2009 : A perfect week-end in the village pharmacy again – We had “ANS – A lot of Spring Rolls, Horse Burgers, Oysters and Good Cigars”. Plus Hand Lotion, Cheese, a brunch in an Irish Pub and much more. 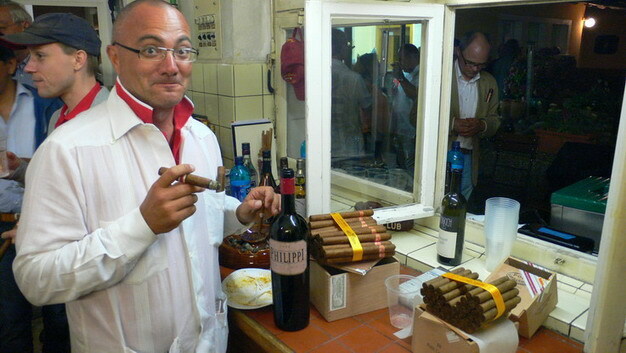 20.11.2009 : A summary of the results of a “Robusto Blindtasting Survey” conducted by Heiko “Eldondo” – Interesting ! 08.11.2009 : Gestern besuchten Christoph und ich das “The Celtic Weekend 2009” in Hofheim/Ts – eine gute Idee, denn wir trafen gute Bekannte und genossen ein perfektes Rum & Zigarren Tasting. 05.11.2009 : The New Cuban Customs Regulations explained and translated. “Surf, Turf and A Good Cigar” – Fingerlickin’ Mouthwaterin’ good ! No wonder I have to start a diet …………. 26.10.2009 : The XII Festival del Habano is getting closer – 22 to 26 February 2010 in La Habana/Cuba. “A Celestial Flight, a Crash Landing and a very high Flight” – Enjoy ! 16.10.2009 : Some 150 pictures from my Europe Trip in 3 Picture Galleries – Enjoy ! 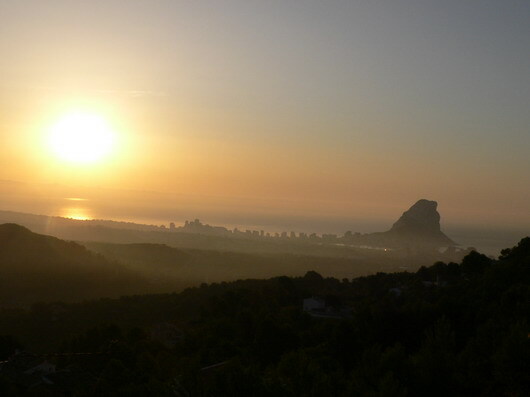 I am back home in one piece after spending some time on the Mediterranean coast and the breathtaking hinterland. 18.09.2009 : Slow cigars on the road in Europe – my first trip after retirement. Enjoying myself. 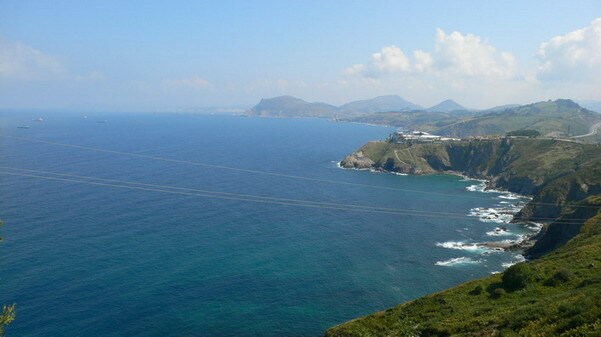 Saludos from Northwest Spain – After 2.300 km on the road passing France, Cantabria and Asturias I am now close to Portugal and 1 week on the road. 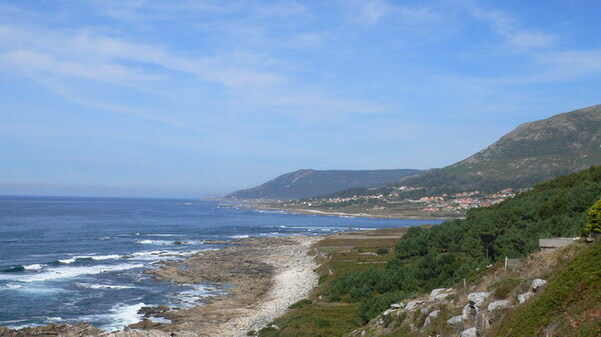 Great landscapes, great coastlines, great food and good cigars. 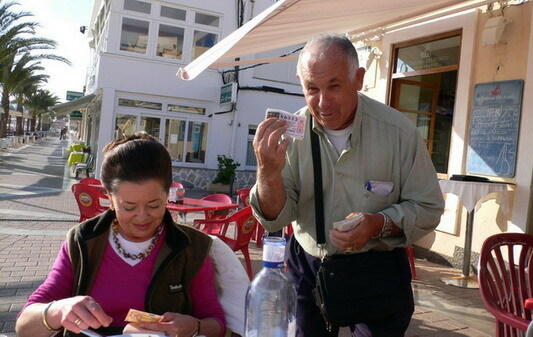 I will be heading to Northern Portugal in a few days – in the high Sierra de la Culebra right now. 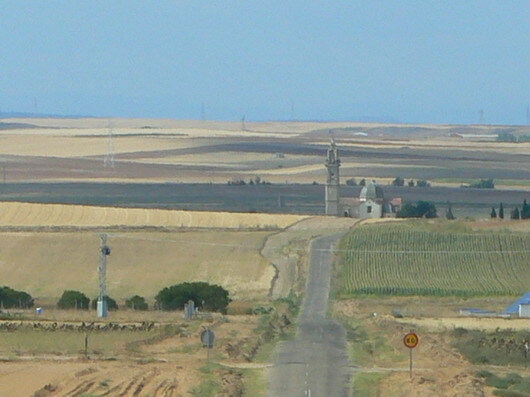 15.09.2009 : 6 years of Nino’s Flying Cigar – On the road in Northern Spain. Visiting the pretty city of Santander. 06.09.2009 : Das Achte Grillfest des Cigar Cult Club Wiesbaden-Mainz fand gestern Samstag bei Frank Widmann am Rheinufer statt – Gabriel wurde als neuer Vorsitzender eingeführt und bekam gleich eine Smokingjacke verpasst – Glückwunsch Gabriel !! 04.09.2009 : Gestern hatten wir einen beschaulichen und ruhigen ANS – Es ging um ” ANS – All New (Bolivar) Smokes” – A very quiet and pleasant Pharmacy Smoke it was yesterday, smoking mostly Bolivar. 03.09.2009 : Es geht wieder los mit Zigarrentastings aus guter Feder : Michael “Turner”, heute : “Joya de Nicaragua Antaño Machito – Tasting von Michael “Turner” – Enjoy ! 01.09.2009 : Ab heute bin ich offiziell im Ruhestand – I am officially retired as of today ! Hier 2 schöne / here’s “2 Celebration Dinners” ! 26.08.2009 : And finally the last day of the event “UPS – Day Five Farewell Brunch” – Auf Wiedersehen in Wörrstadt ! 26.08.2009 : Cigar Bus, sparkling Wine, fine Riesling, a burst cooling water line – lots of excitement on “UPS – Day Four on the Cigar Bus”. 25.08.2009 : Dirty looks, traffic jams and a heat wave, that is what I got on “UPS – Day Two Driving Around”. 24.08.2009 : Here’s the detailed story on day one “UPS – Day One Gino and Anna” Sunny Rheinhessen Toscana Feeling ! 23.08.2009 : Wir hatten ein “UPS – United (Nations) Pharmacy Smoke” der sich vom 19 bis 23 August zog – allen Teilnehmern Danke, wir hoffen es hat euch gefallen ! We held a “UPS – United (Nations) Pharmacy Smoke” from 19 to 23 August – Thanks to all participants – we hope you enjoyed the event ! 17.08.2009 : Warum in die Ferne schweifen, wenn das Gute liegt so nah – gestern war : “Alles Tomate in Eckelsheim” – Rheinhessen von seiner schönsten Seite. Why fly far from home living in such a beautiful region ? Yesterday was ” Tomato Day in Eckelsheim” a lovely neighbouring village in beatiful Rheinhessen. 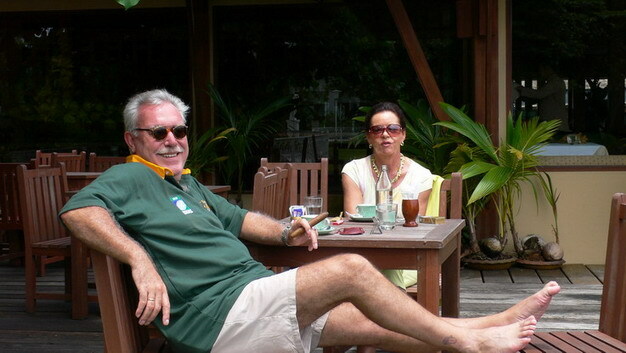 Last report so far in the Culinary Cigar Adventures series – Retired life is sunny ! 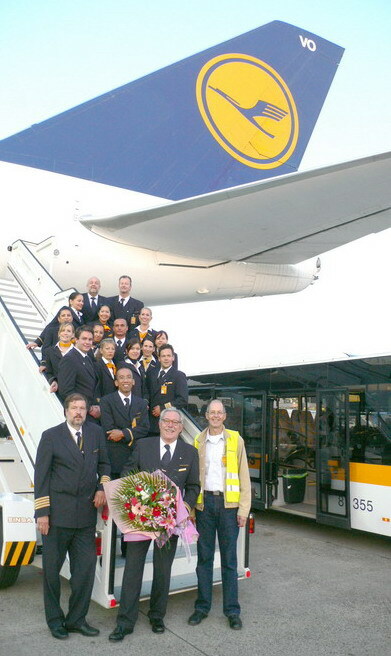 27.07.2009 : Gestern morgen bin ich von meinem letzten aktiven Umlauf bei der Deutschen Lufthansa gelandet. Es war seit 1975 eine wunderschöne Zeit die ich nicht vergessen werde – Herzlichen Dank an meine letzte Crew !! 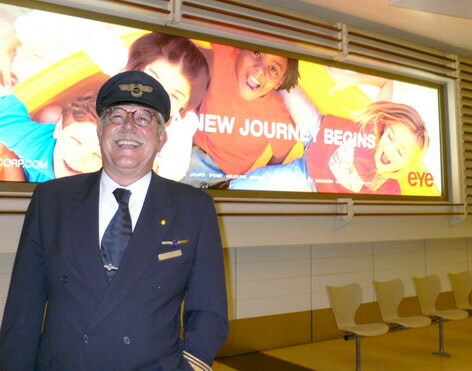 Yesterday morning I landed back from my last active duty rotation with Deutsche Lufthansa. 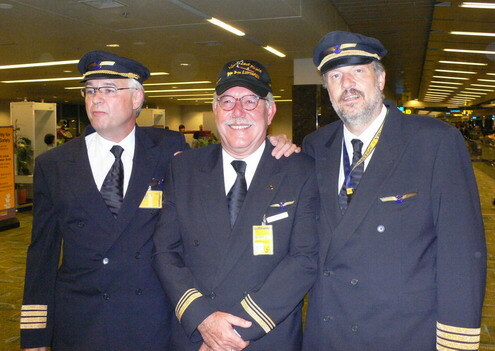 It has been a wonderful time ever since 1975 and I will always remember it fondly – A big thank you to my last crew !! 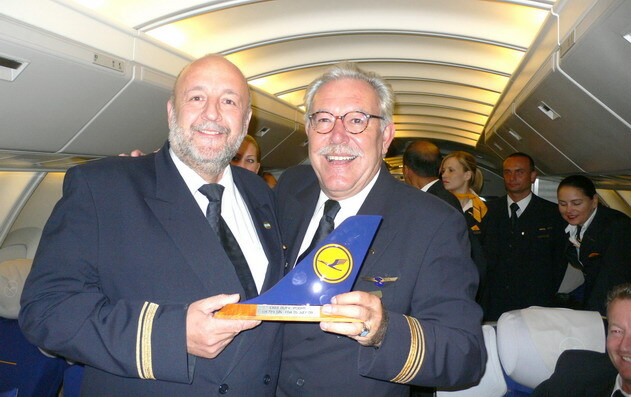 FRA 26.07.2009 LH 779 – Danke an Alle !! 19.07.2009 : Und hier eine “Bangkok – Foto Galerie” – Here’s a“Bangkok – Picture Gallery”. 18.07.2009 : Zurück von meinem vorletzten Umlauf – Es war schön in “Bangkok – von der Soi Cowboy bis Rose Garden”. 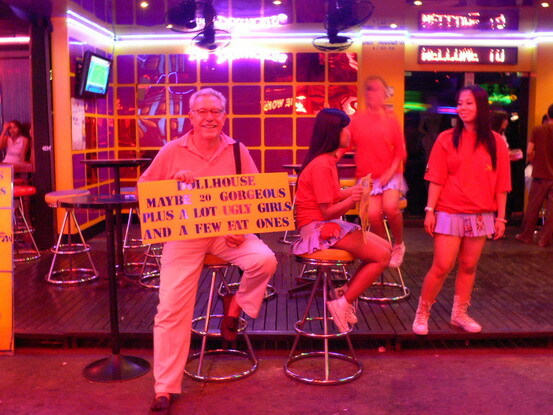 Back from my pre-retirement rotation – it was nice in “Bangkok – from Soi Cowboy to Rose Garden” . 01.07.2009 : Unser gestriger “ANS – Flasche geköpft – Beheading the French … Bottle” – schön war’s ! 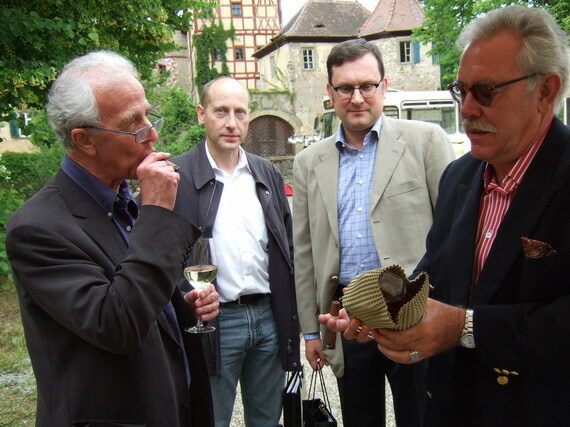 24.06.2009 : Und hier der Bericht zum “Habanos Day 2009 – The Event” – freue mich bereits auf den nächsten Habanos Day !! And finally, the report on the event itself – look forward to the next one !! 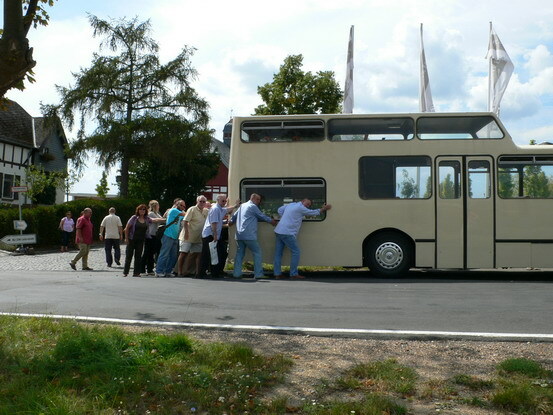 23.06.2009 : Fangen wir mit der Fahrt an – Es war “Ein Fun Trip zum Habanos Day 2009” – hier der Beweis ! 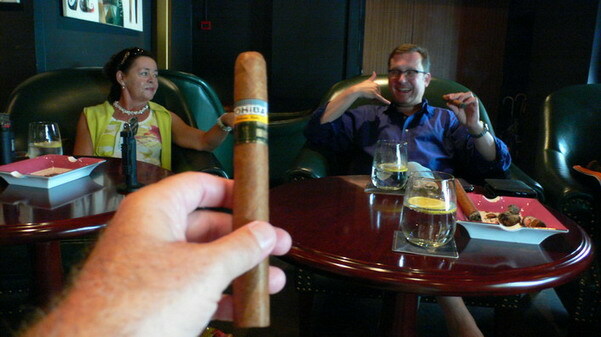 The trip up to the Habanos Day was a hell of a funny and privileged ride – we can prove it, check out the pics ! 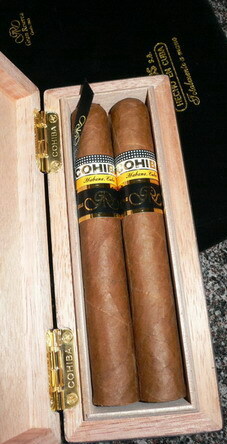 21.06.2009 : Gerade zurück – hier meine “Ersten Eindrücke vom Habanos Day 2009” – soweit vorab : Es war grossartig !! 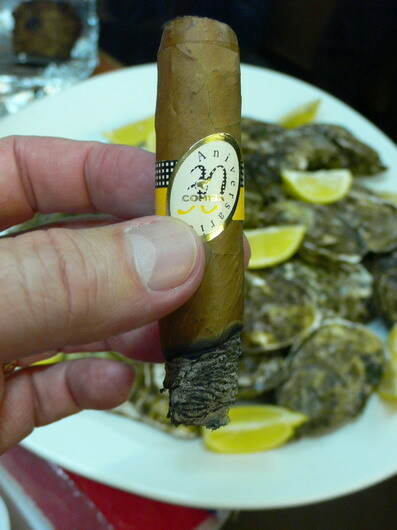 Just back – here my “First Impressions of the Habanos Day 2009” – all I can say is : It was fantastic !! 19.06.2009 : Here we are, heating up the Bus, enjoying great T-Bone steaks and lighting up good cigars at Massimo’s in the village before leaving for the Habanos Day Germany event tomorrow – “Habanos Day 2009 – Heating Up in Wörrstadt” – Enjoy ! 15.06.2009 : A new Tasting by Heiko “Eldondo” : “Bolivar Elegantes EL” – And while I am at it, here’s the last installment of ” Smoking Now April – June “ – will be updating this section very infrequently now. 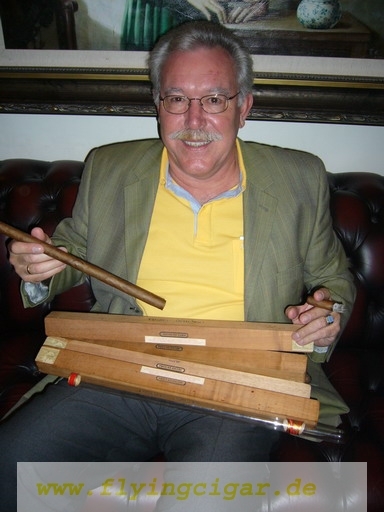 12.06.2009 : The highlight of my Spain trip was my time in “Madrid smoking a cigar with Rafael Bernardo at the Club Pasion Habanos” – A very special cigar in my favourite city – Gracias Rafael !! 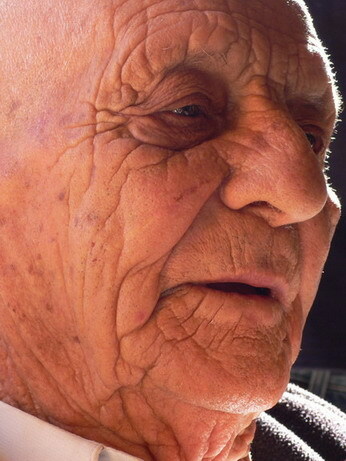 Rafael Bernardo & Matanzas 1993 – Gracias Rafael ! 11.06.2009 : Back in Spain again and here are “Some Interesting Spanish Market Specials – Part Two”. Enjoy ! 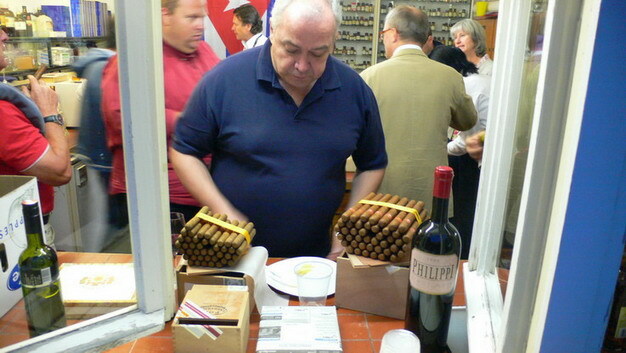 09.06.2009 : While I am back from Spain and a great smoke with Rafael Bernardo in Madrid, here is a highly recommended Cigar Tour to anyone visiting London “The Cuban Cigar Walk in London” by Nic Wing of Cities in Sound. 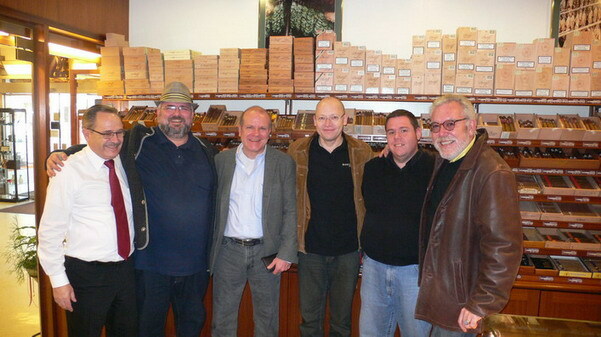 Zurück von einem Besuch in Spanien und einer grossartigen Zigarre mit Rafel Bernardo in Madrid – hier eine sehr empfehlenswerte Tour für jeden London Besucher “The Cuban Cigar Walk in London” – Take the Tour and Enjoy a cigar in London !! 30.05.2009 : Eine schöne Art die Woche ( oder für mich den Monat ) zu beenden – A nice way to celebrate the end of the week ( or : the end of the month in my case ) – “Just Another Fine Friday Smoke At Massimo’s” – Enjoy ! 23.05.2009 : Sonniges Wetter, gute Freunde, gute Zigarren – Sunny weather, good friends, good cigars : “Absolutely Nice Smoke in the pharmacy” – Danke Andreas !! Riding into the Sunset ………. 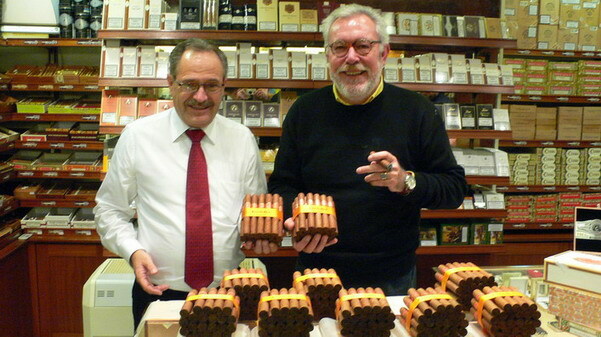 10.05.2009 : Andreas got a perfect London souvenir – the much sought after “Por Larrañaga Magnifico ER UK Humidor”. Happy Smoking, Andreas ! 30.04.2009 : We spent some time in Spain and these are “SMS – Interesting Spanish Market Specials that I found there. 18.04.2009 : Another Friday dinner with my friends, another good cigar – this time a “ERdM 120 Aniv. 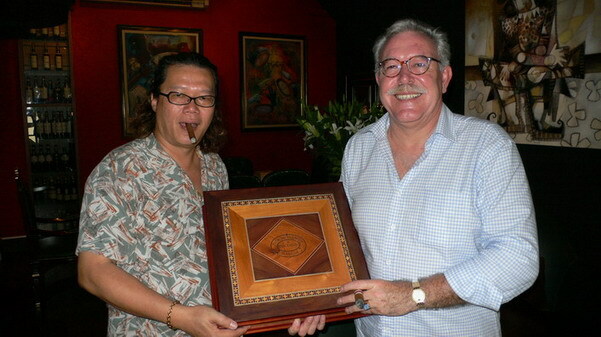 Humidor Torpedo MRN” – The cigars were gifted to me by Mr Min Ron Nee last January in Hong Kong – Enjoy ! 13.04.2009 : Here’s how I am enjoying my break : “ERdM Vikingo ER Baltico” – smoked on Easter Sunday in the sun – Enjoy ! 01.04.2009 : As every year, here’s the April first “special” – this time a “Spot the Fake Habana Contest” – Wie jedes Jahr, hier wieder mein Erster-April Spezial. 31.03.2009 : A link to one of the best Blogs out of Cuba – Hier ein Link zu einem der besten Blogs aus Kuba – Aqui un enlace a unos de los mejores Blogs Cubanos : “Desde Cuba – Generacion Y Blog – Yoani Sanchez”. 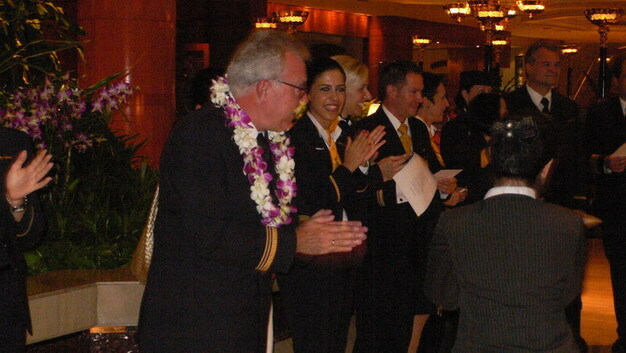 30.03.2009 : Here’s the report on my second flight this month to Shanghai – it was “Shanghai 2 – Highspeed from Dunhill to Barbie to Pyongyang/North Korea” – What an amazing experience to be had in half a day ! Thank you, Fatcigar !! And as an added bonus, here’s a “Shanghai 3 – Picture Gallery” of my last flight – Enjoy ! 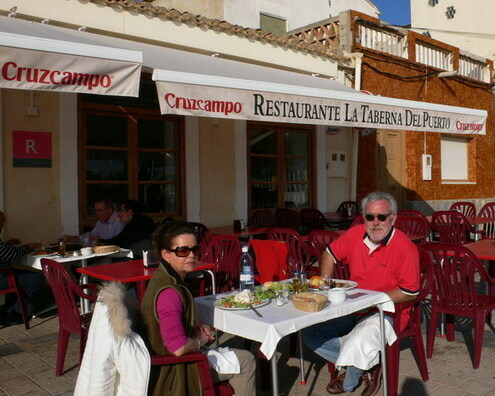 Estanco Roig is again open for the best service in the Balearics – Welcome Miguel Roig ! 28.03.2009 : Wir hatten einen sehr schönen Abend gestern – und zum Abschluss …. 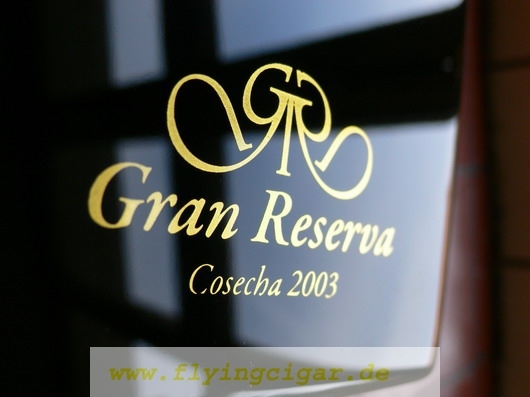 We had a very nice evening yesterday and we ended it “Smoking the Cohiba Gran Reserva Cosecha 2003” – Not a bad way to have some fun ….. Thank you very much, gentlemen ! “Angekommen in Varadero kommen wir als Erste durch den Zoll und es gibt keine Probleme bei der Einreise. Die dunkelhäutige „dreitageoberlippenbärtige Zöllnerin” fragt mich eigentlich nur nach meinem Vornamen und ob dieser italienisch sei. “Direkt hinter dem Capitol ist die Partagas-Fabrik wo der „Berufliche”, der „Leidenschaftliche” und der „welcher mit Zigarren eigentlich nichts zu tun hat”, gerade schwer am Rauchen sind. Wer solche und andere höchstinteressante Sätze lesen möchte, sollte “2009 Kuba – Ein Reisebericht von Mario” nicht verpassen, der seit heute online ist. Viel Spaß bei der Lektüre und : Herzlichen Dank, lieber Super Mario !! Feliz Noventa Cumpleaños, Don Alejandro ! 13.03.2009 : Und hier meine letzten 5 Berichte/Fotogalerien zum XI Festival del Habano – Viel Spaß ! My last 5 Reports/Picture Galleries on the XI Festival del Habano – Enjoy ! 07.03.2009 : Ich hatte noch Zeit für einen kurzen Bericht : “XI FdH – A short review of 2 new releases” – Nächste Woche geht es weiter. I had some spare time for a short report on 2 new release from the Festival. More reports next week. 07.03.2009 : Ich habe nach meiner Rückkehr aus Kuba nur noch von Zigarren geträumt – es wird Zeit wieder zu fliegen und an etwas Anderes zu denken. Bevor es aber wieder nach China geht, hier 6 Fotogalerien und Berichte zu unseren Aktivitäten beim XI Festival del Habano – Viel Spaß ! I have been having dreams about cigars after returning home from Cuba – it’s high time to go back flying and see something else for a change. But before taking off for China again, here are some 6 picture galleries and reports about our activities at the XI Festival del Habano – Have fun ! 04.03.2009 : Gestern sind wir wieder aus Havanna zurück – wieder eine sehr schöne und interessante Reise zum Herzen der Zigarre. Hier mein “Vorbericht / Preview des XI Festival del Habano – eine kleine Fotogalerie”. Es wird noch etwas dauern bis alle anderen Galerien on-line sind. We returned home yesterday from Havana – once again a beautiful and interesting trip to the heart of the cigar. Here’s a “Preview of the XI Festival del Habano – a picture gallery”. It will take a little while before all other galleries are up and running. 21.02.2009 : Und hier mein gestriger Abend beim “ANS – Apotheken-Notdienst-Smoke am 20.02.2009” – Viel Spaß ! Und weitere 2 Kapitel aus der Saga “Singapore – Jimmy’s Treasures – Part Three” und “Singapore – Jimmy’s Treasures – Part Four” – Viel Spaß beim anschauen ! And another 2 chapters in the fascinating saga of “Singapore – Jimmy’s Treasures – Part Three” and “Singapore – Jimmy’s Treasures – Part Four” – Enjoy ! 12.02.2009 : Die Festival Kappen sind aus Korea angekommen – Danke Lee !! – es ist alles für Kuba vorbereitet !! 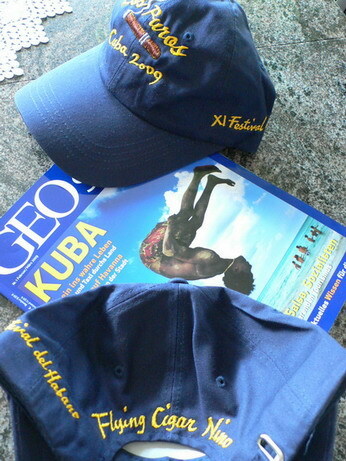 The Festival caps have arrived from Korea – Thanks Lee !! – all is ready for Cuba !! Kappen & Bücher – Kuba wir kommen ! 11.02.2009 : Hier ein Bericht über Reisbällchen mit Sesamfüllung, viel Feuerwerk und ein abgefackeltes Luxushotel in “Beijing Yuan Xiao Jie”. 07.02.2009 : Leider es nicht zu Urs nach Kreuzlingen geschaftt – es gab aber dafür ein Abend “Smoking in the Office bei Andreas in der Apotheke”, mein Trostpreis. Regrettably I could not make it down to Urs in Switzerland – the consolation prize was “Smoking in the office at the pharmacy with Andreas”. 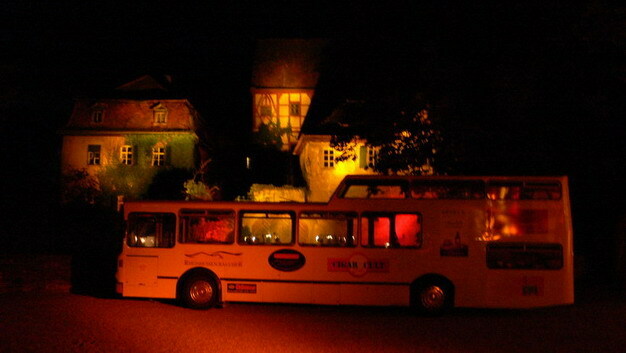 Die Rheinhessenraucher sowie der Cigar Cult Club haben eine Busfahrt dorthin sowie das Hotel bereits geplant – hier kann man sich anmelden. 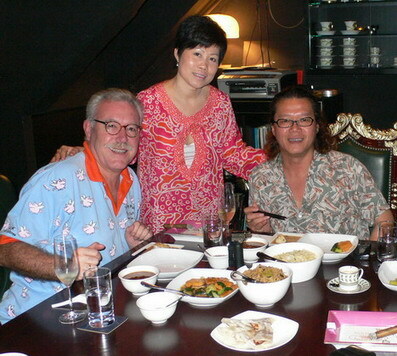 “Hong Kong – Visible Inmenso days with Min Ron Nee”. 26.01.2009 : Wir sind auch in der Provinz sehr International – beim gestrigen Apotheken Notdienst Smoke (ANS) ging es “Von Rheinhessen zur Ukraine über die Oberlausitz und Barbados” – eine kulinarisch/alkoholische Rundreise. Yesterday’s pharmacy smoke was an international culinary/alcoholic round-trip, Ukranian Sausage and Pork Fat, Rum from Barbados, wines from Chile and Mallorca, cigars from Cuba and good local fun and friends. 25.01.2009 : Neuer Link zu Hadyphoto – ein Fliegerkollege und ein passionierter Fotograf mit atemberaubenden Aufnahmen aus aller Welt … Hady Khandani. New Link to Hadyphoto – a passionate photographer with breathtaking worldwide photographs … and a flying colleague – Hady Khandani. 24.01.2009 : Just before the start of the Chinese New Year, Min Ron Nee, the renowned author and collector, once again offered unrivalled hospitality during my visit to Hong Kong. Two days were enjoyed smoking rare and excellent vintage cigars, eating the tastiest food and drinking some of the best champagnes and cognacs. A report will follow in a few days. For now let me express my sincerest gratitude to the gracious host, Min Ron Nee – it was an unforgettable experience ! Zum dritten Mal habe ich in Hong Kong die beispiellose Gastfreundschaft von Min Ron Nee, dem bekannten Autor und Sammler, geniessen dürfen. Zwei Tage habe ich ausgesuchte, rare Zigarren, exzellentes Essen und feinste Champagner und Cognacs probieren dürfen. Ein Report folgt in einigen Tagen. Hier mein Dank an Min Ron Nee für dieses unvergeßliche Erlebnis ! 20.01.2009 : Heute ist “Obama-Day” – ich werde die Feierlichkeiten allerdings verpassen da ich nachmittags einen langen Flug vor mir habe, aber … diese Zigarren werden mitfeiern ! Today is “Obama-Day” – I will miss the celebrations as I have a long haul flight this afternoon, but these cigars will be part of the celebration ! 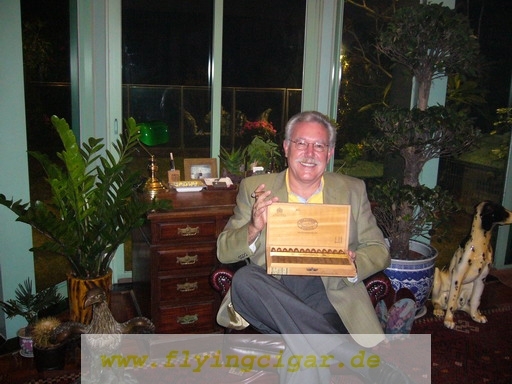 17.01.2009 : Die Eröffnung der Casa del Habano in Frankfurt habe ich gestern zwar leider verpasst, aber hier ist eine Fotogalerie der “Eröffnung/Opening La Casa del Habano Frankfurt” freundlicherweise von Gabriel “Atacama” zur Verfügung gestellt. UPDATE 25.01.2009 : Mitraucher Rainer Höckendorff aus Augsburg hat mir ebenfalls Fotos zugesandt ! Danke ! Here’s a picture gallery of yesterday’s opening of the new La Casa del Habano in Frankfurt – Enjoy ! 17.01.2009 : Meine Feierabend Zigarre gestern Abend nach der Landung aus Beijing, rauchte ich zu Ehren der Crew von US Airways 1549 unter Cpt. C. Sullenberger, die ein derart beispielhaftes und professionelles Verhalten in New York zeigte. 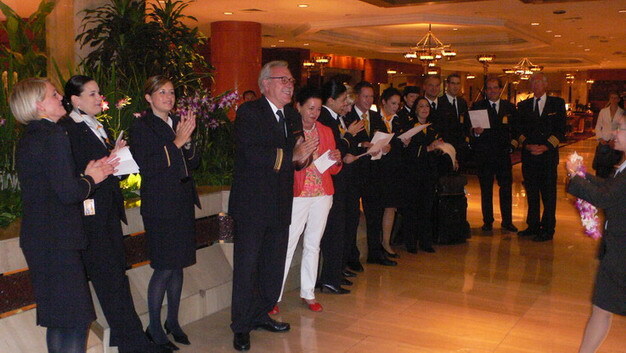 Yesterday I smoked a good „after landing cigar” in honour of the crew of US Airways flight 1549 with Cpt. C. Sullenberger in command, that demonstrated an admirable degree of professionalism in New York. Hier mein Bericht : “Der Hudson River von Beijing aus betrachtet” . 13.01.2009 : Hier weitere Kairo Fotos in der “Kairo Fotogalerie”. Und bevor es wieder nach Beijing geht, hier ein Bericht von Andreas “Rheinhessenraucher” aus dem “Raritätenkabinett : “Steckdosenessen schwergemacht” – Nein, es geht hier nicht um Starkstrom sondern um ………. halbe Sauköpfe :-)) Mahlzeit ! 12.01.2009 : Hier wie versprochen mein Bericht über “Kairo – Eine Pyramide bei den Pyramiden”– morgen kommt noch eine Kairo Fotogalerie dazu. 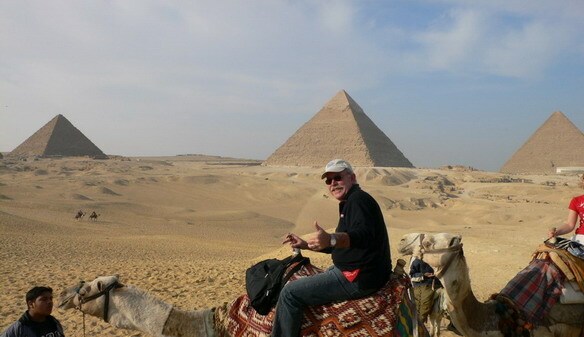 Smoking a Pyramide at the Gizeh Pyramids, Cairo – Egypt / Happy Birthday, Urs !! 11.01.2009 : Heute habe etwas Zeit und konnte mich um “Smoking Now – Dezember” kümmern. Herzlichen Dank für die Einladung zur Eröffnung der neuen La Casa del Habano in Frankfurt/M. Ich werde in Beijing/China sein – wünsche dennoch viel Erfolg !! 10.01.2009 : Und es geht auch gleich gut weiter ! Gestern hatte Urs Portmann, unser lieber Freund aus Kreuzlingen am Portmannsee, seinen 60-jährigen Geburtstag. Alles Gute Lieber Urs !! In Kairo rauchte ich gestern zu Urs’ Ehrentag eine Pyramide an der Cheops-Pyramide in Gizeh und ritt im Kamel an der Sphynx vorbei – ein sehr beeindruckendes Erlebnis. Mehr dazu in einem Bericht in wenigen Tagen. 07.01.2009 : Das Jahr des Ochsen hat sehr gut begonnen – “in Nagoya/Japan feierten wir mit Maru-san, einen Natural Born Genius, Silvester” – es waren sehr angenehme, schöne Tage in Nagoya. The use of these images, other than for private, individual, non-commercial use is prohibited!